When talk turns to Hawaiian cuisine, most people think of teriyaki chicken or pizza with pineapples. Predominantly influenced by travelers and laborers from Japan, Portugal, Korea, and the Philippines, Hawaiian kitchens offer a veritable U.N. conference for the taste buds. But the Polynesian travelers who first settled the islands found themselves in a place remarkably devoid of food. In fact, the most isolated archipelago in the world offered only edible fern shoots and fish, the latter of which was coarsely cut into chunks, tossed with sea salt, and eaten raw. Poke (pronounced like OK) is the Hawaiian word for “to cut,” and along the way, the process became the namesake. Still a fundamental part of the Hawaiian diet, poke is available by the pound at every island grocery store. Flavors range from traditional shoyu (shoyu [soy] sauce, scallions, white onions and sesame oil) to sunrise and ninja flavors, which include decadent additions like mayonnaise, Sriracha, avocado, tobiko, or furikake. Poke bowls — a large scoop of the above plopped upon a hot mound of rice — are usually available, as well. Welcome to the twenty-teens, where this previously uncommon 2,500-hundred year-old dish has suddenly arrived on the mainland in a big, albeit slightly altered way. Charleston’s Poke Tea House is hip to the trend, and the bright, airy space is following the format springing up all over the country, with a few set menu items and a huge array of “have it your way” choices. 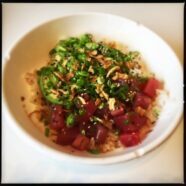 For those with previous experience and related expectations, the house specialty ahi tuna poke bowl ($10) is the most traditionally Hawaiian option. The generous mound of rice is topped with chunks of tuna, soy sauce, and sesame oil, plus scallions and sesame seeds, and the varying textures and flavors marry well. The sauce is applied after the fact, so the fish isn’t permeated so much as doused, but you still get the gist. Whereas the Hawaiian fish-to-rice ratio is usually about 1:1, be aware the mainland portion is, well, much smaller, with less than two ounces per bowl. (I brought my kitchen scale and measured it.) Still, this might be as close as you can get to Kahului in Charleston, and after living on Maui for four years, it’s close enough for me. In contrast, the Hawaiian salmon poke bowl ($11), although beautiful, was less to my liking. Love seaweed? Brace yourself for the motherlode. Featuring Japanese seaweed salad (goma wakame), red ogo, chopped mango, and cucumbers, as well as togarashi and tobiko, this struck me as a little more Japanese than anything — the chirashi bowl’s brother from another mother. Topped with a soy-based oba sauce, the delicate fish struggles to stand up to the plethora of crisp, fresh toppings. It’s flavorful, but not really what I think of when I think of poke. 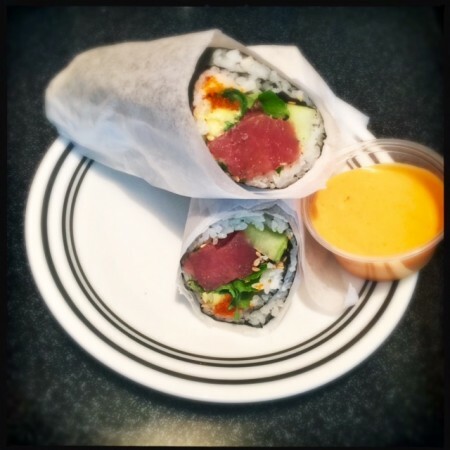 But that’s just my opinion, and points to where Poke Tea House shines most brightly: the poke your way ($11.99 one protein, $13.99 two proteins) DIY options. Grab a menu, circle your options from a near-dizzying array of ingredients and wait as it’s assembled. With nine proteins including chicken and eel, 11 mix-ins ranging from tamago to shiso leaves, and 10 toppings including squid salad and corn, I’m not good enough at math to tell you how many combinations you could make, but it’s a lot. And considering there are also 10 flavored sauce options and the choice of seaweed burrito or green salad bases, odds are anyone can muster a concoction to their liking. As if to prove that point, Poke Tea House also offers a signature vegan bowl ($8), where all preconceived notions are best left at the door. If blindfolded and fed this, would I know it’s poke? No, but that’s all right. 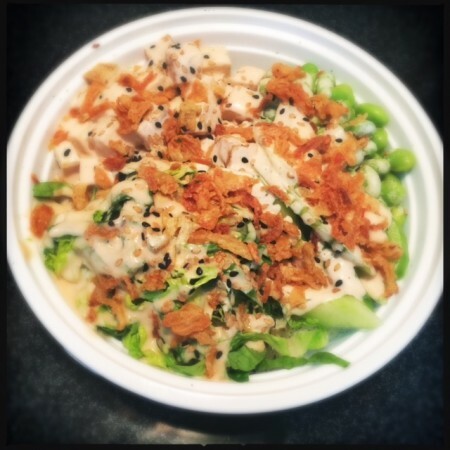 Tofu, edamame, scallions, and cucumber are plated on rice and romaine lettuce and topped with a creamy mayo-based sauce. It sounds strange, and well, it is strange, but it works. With a good mix of textures and light, clean flavors, it’s reminiscent of when you get some of the soggy salad that always accompanies teriyaki mixed in with rice, but in a good way. If all this healthy eating fails to inspire, Poke Tea House also sells bubble tea in (of course) a plethora of flavors. The Taiwanese tea-based drink is sweet and can be made with traditional chewy tapioca balls and even “popping Boba”, pearl-sized beads filled with fruit-flavored syrup, that explode when you bite them. 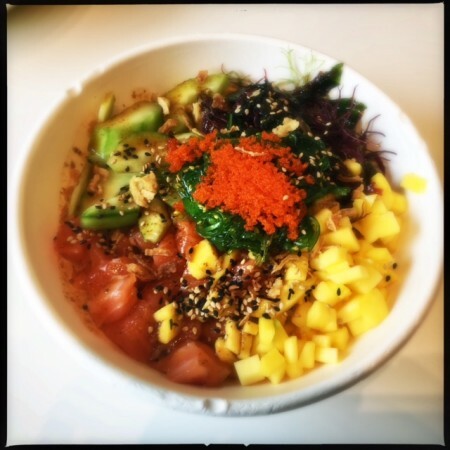 A sugar rush ending to your light, rice-based meal, the fast service-style poke shop phenomenon isn’t exactly Hawaiian, but the spirit of quick, healthy convenience perseveres. It’s the Chipotle of Polynesia, by way of Japan, and a fresh, charming hybrid at that.